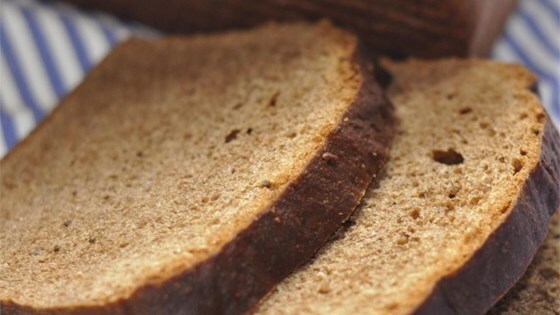 "This flavorful rye bread is heavier than most rye breads because it has no wheat flour. It also takes some time but its worth the wait!" Heat the milk in a small saucepan until it bubbles, then remove from heat. Let cool until lukewarm. In a small mixing bowl, dissolve yeast in the lukewarm milk. Let sit until creamy, about 10 minutes. Pour the yeast mixture into a large mixing bowl. Mix in the molasses, egg, 4 cups of the rye flour, salt, and caraway seeds. Cover with a damp towel, and let rise for 45 minutes. Stir in the remaining rye flour, 1/2 cup at a time, until the mixture forms a soft dough; stir well after each addition. (You may not need to add all of the rye flour. )Turn dough out onto a lightly floured surface, and knead until smooth and elastic, about 8 minutes. Lightly oil a large mixing bowl, place the dough in the bowl, and turn to coat with oil. Cover with a damp cloth, and put in a warm place to rise until doubled in volume, about 1 hour. Deflate the dough, and turn it out onto a lightly floured surface. Divide the dough into two equal pieces, and form into loaves. Place the loaves into two lightly greased 9x5 inch loaf pans. Cover the loaves with a damp cloth, and let rise until doubled in volume, about 40 minutes. Bake in a preheated 350 degrees F (175 degrees C) oven for about 30 minutes, or until the top is golden brown and the bottom of the loaf sounds hollow when tapped. The best whole rye flour bread that I have ever made. It stays moist and fresh for days. Doesn't require the full amount of flour listed in the ingredient list, if you follow the directions just right where it says "may not need the rest of the flour" it comes out great.